The Hawaii Congress of Parents, Teachers, and Students, also known as the Hawaii State PTSA, is a registered 501(c)(3) non-profit organization made up of volunteers dedicated to improving the lives of Hawaii's keiki. 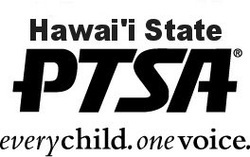 Chartered in 1926, the Hawaii State PTSA is Hawaii's oldest and largest child advocacy organization. We are a state charter of the National PTA, made up of local units throughout the State of Hawaii. Our goal is to improve the lives of children in Hawaii. The Hawaii State PTSA prides itself on being a powerful voice for children, a relevant resource for parents, and a strong advocate for public education. Membership in the Hawaii State PTSA is open to anyone who is concerned with the education, health, and welfare of children and youth, and supports the mission of PTA. Welcome to our PTA Spotlight! Each month the Hawaii State PTSA seeks to recognize the amazing things our local PTAs and PTSAs are doing for Hawaii’s keiki. This month's PTA Spotlight goes to Lahainaluna High School PTSA. For more information on Lahainaluna High School PTSA’s activities and to learn about their tips for success, check out our PTA Spotlight page. If you have a story you would like to share, please complete our PTA Success Form. canbe used to promote your PTA/PTSA.